A deserted Sunday in town, the streets outside Pinter's department store almost empty. 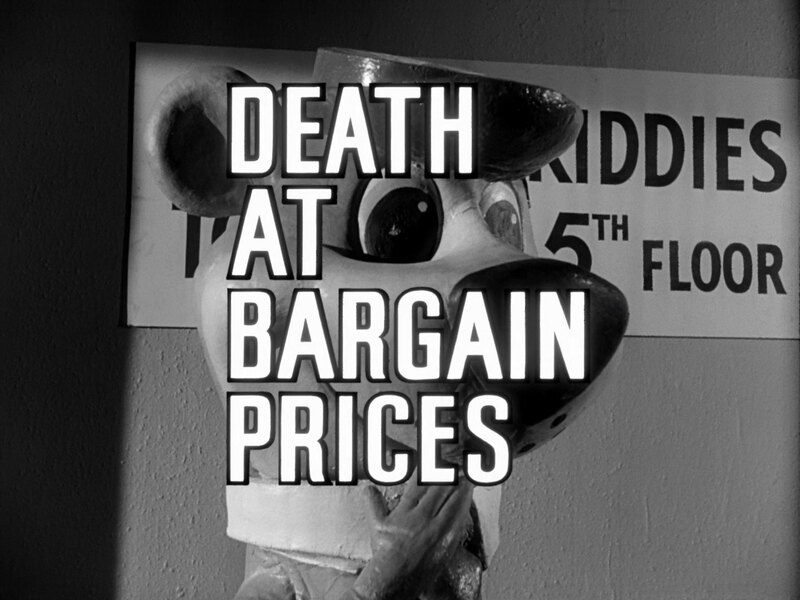 Inside, Ministry agent Moran (Arthur Gross) is searching the store and gets out of the lift at the nursery department. He sees an inflatable Yogi Bear quiver and Wentworth (T.P. McKenna) steps out from behind it with a silenced pistol. Moran flees in the lift but it moves slowly and he's a sitting duck for Wentworth, who kills him cold-bloodedly. 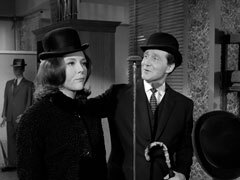 Steed is Directed by Farthingale (Allan Cuthbertson) and Massey (George Selway) to the headwear department where he meets Mrs Peel. She complains about being dragged away from thermodynamics and he tells her that Moran was found shot six times in an alleyway - their only lead is a receipt from the store dated the previous day. (No Sunday trading in the Sixties, remember!) They visit the department in question and are startled to discover it's the nursery department. Mrs Peel notices some of the displays have the merchandise mixed up - someone doesn't know his job and Steed suggests that maybe they need an assistant... Mrs Peel is installed at the lingerie counter and meets Jarvis, the house detective (John Cater), who briefs her on store security then tells her, "Don't worry about not knowing the ropes, none of them here do". 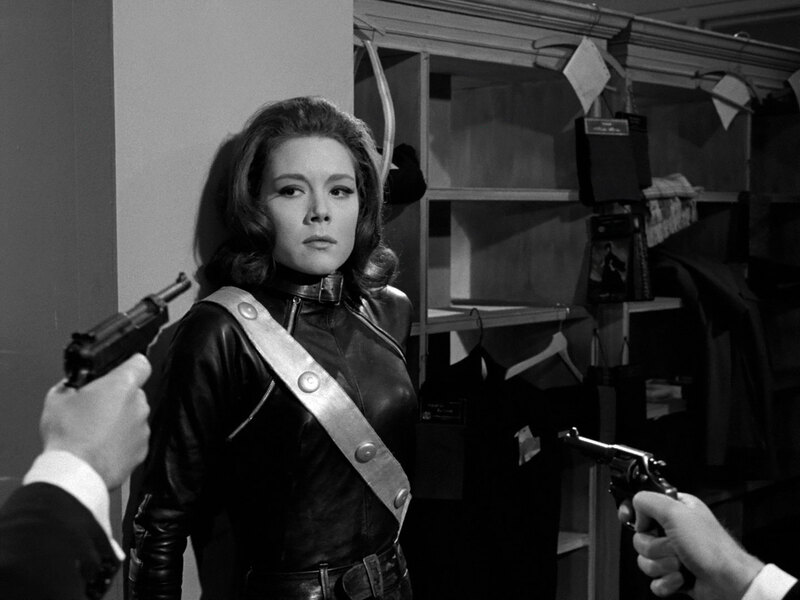 Steed arrives a moment later and tells her, "I asked the chief predator where to find you and he said 'Our Mrs Peel is in ladies underwear' - I rattled up the stairs three at a time". She tells him about the staff ineptitude and he offers more information - Pinter's was bought lock stock and barrel by Horatio 'King' Kane, a founding father of modern industry, a year ago and he replaced all the staff with his own. Emma heard some of the staff mention the 'King upstairs', in the department of discontinued lines, and directs him. Steed sneaks past Farthingale (Allan Cuthbertson) who is in the executive rest room and enter Kane's lair, a dusty collection of antiques. Farthingale warns Wentworth there's an intruder and draws a pistol from his jacket. Steed claims to be an efficiency expert, seeking to save Pinter's from ruin in return for a fat fee. Kane ignores his offer and says people say he out of date, living in the past. He shouts that he'll show them, Kane will... then stops and tells Steed he's wasting his time; he's just a tired, sick, old man. He tells him Wentworth runs the store, at which Wentworth enters. Wentworth tells Steed he shouldn't be up there and escorts him out. He tells Steed that Kane is old and querulous, and a bit susceptible; they must protect him from those who find a chink in their armour. He bids Steed farewell - and then he brutally punches Steed in the face. Downstairs, Mrs Peel overhears the chief window dresser, Glynn (Ronnie Stevens), complaining to Jarvis that there's another staff meeting that night that he's not been asked to attend. It's the third that week, and only a select few attend. Mrs Peel asks if it's usual for that many meetings and Jarvis says sometimes every night of the week. "Even Sundays?" she asks, at which Jarvis stares at her. She asks if they're held in the store and he advises her to get that idea out of her head. Jarvis says he's noticed her listening in to every conversation then says he's with her - there is something odd going on, he could help her. She claims to be from the Ministry of Labour and gives him her number, then is ushered off the premises by Farthingale. Steed arrives at Mrs Peel's flat and she gives him something for his black eye then gets back to her thermodynamics paper. Steed shows her a newspaper clipping he stole from Wentworth's apartment earlier - Wentworth was a mercenary in the Congo. 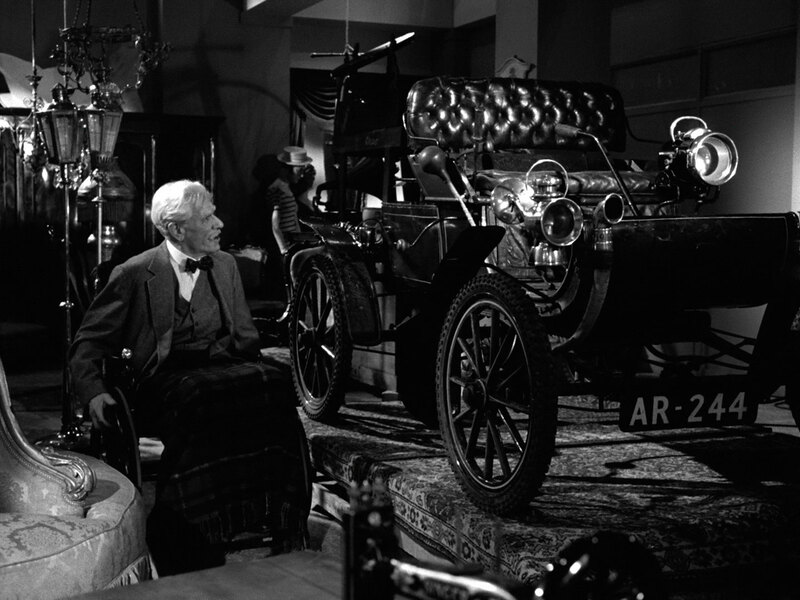 At the store, Jarvis spies on the staff meeting, where Wentworth is tell his men they are nearing completion. Tony Marco (Harvey Ashby) as when that will be, then Farthingale marches a dishevelled Professor Popple (Peter Howell) in. Wentworth tells him he'll have to work faster and the professor complains about being cooped up. Jarvis sneaks away and calls Mrs Peel, telling her to come to the camping display on the ground floor - he's left the side door unlocked. When she arrives, Jarvis is dead, skewered on a scythe. 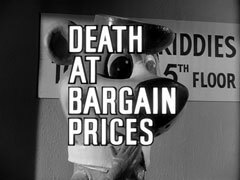 Next morning she tells Steed the body disappeared during the night and she's been moved to the Toy Department and Glynn has been dismissed. Steed finds Glynn and learns that he was dismissed after complaining that his ground floor display gets changed every night. He says Julie will be next after being blamed for thefts from her counter. Steed visits her and asks for ½ oz. of Stilton, and a few other ingredients for a recipe. She smiles and asks if he wants it wrapped, then he asks about the thefts. Julie confirms that food goes missing from her counter during the night, including honeyed bumble bees which they never sell and only stock because Professor Popple placed a special order - Popple went missing a few months ago. 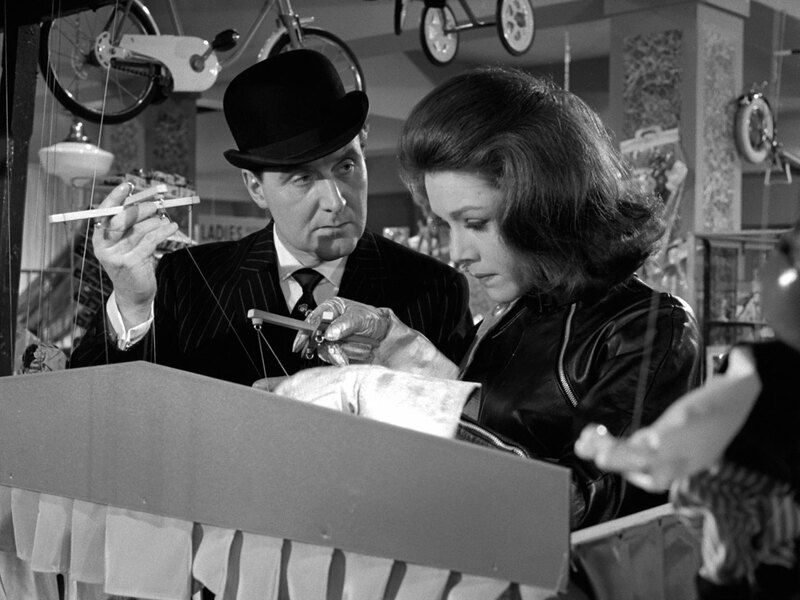 Mrs Peel tells Steed Popple is a nuclear physicist and takes Moran's receipt to see what she can stir up. Massey meanwhile is being reprimanded by Wentworth for pilfering food for the Professor. Wentworth asks for mArco, but he's busy trying his luck with Mrs Peel. She rebuffs him then asks him the check the receipt, which doesn't belong to her department. He blanches when he reads it and tells her Mr Wentworth will want to talk to her. He locks her in the Executive rest room and goes to fetch Wentworth but while he's away she searches the room and finds a hidden door operated by a fire axe. Inside, she finds store rooms, then banks of computers and scientific equipment at while a manacled Popple works. she turns to run when Massey spots her, and is faced with the pistols of Marco and Wentworth; the three men converge on her. Steed is worried when he can't find Mrs Peel at closing time and Farthingale tells him she was dismissed for philandering with the customers. After the store has closed, Farthingale tells Wentworth that Massey is guarding Mrs Peel in the furniture department. Wentworth and Marco go to check the detonation area and Steed, who's hidden away in the camping display, sets off for the furniture department. He easily disposes of Massey, who's playing solitaire, and unrolls the carpet in which Mrs Peel has been stowed. She takes him to the Professor, who they find drugged, and Mrs Peel realises the store receipts are punch cards for the computer. She feeds them in and it spits out a diagram and chemical formulae. Popple suddenly mumbles, "A bomb! Must stop them!". He tells them the bomb is down in the store and it was his job to finish it. The Avengers rush off and search the store but are unable to find anything. Mrs Peel suddenly notices the tiling on the ground floor matches the diagram - the arrow points to a lift to the basement - and they realise the building is the bomb. On the ground floor, they run into Farthingale and Kane. 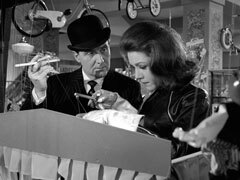 Farthingale disarms Steed and takes the diagram from Mrs Peel; Kane peers at it myopically and asks Steed if he still thinks him inefficient. He proudly outlines his plans for his most audacious takeover bid yet - he will hold the entire country to ransom with his bomb. They'll believe that he still understands modern methods when he destroys a large part of London - sometime tomorrow a customer will ask to see a washing machine and when the lift descends the bomb will be detonated, taking out everything in a 50 mile radius. Kane and his closest staff will abscond to the North for safety that evening. Wentworth arrives and Kane tells him to dispose of them but Steed grabs a ping pong ball gun and surprises Kane; Mrs Peel rushes him and they escape down the stairs. Kane is enraged and bellows at his henchmen to stop them reaching the doors, not realising they have no intention of leaving. 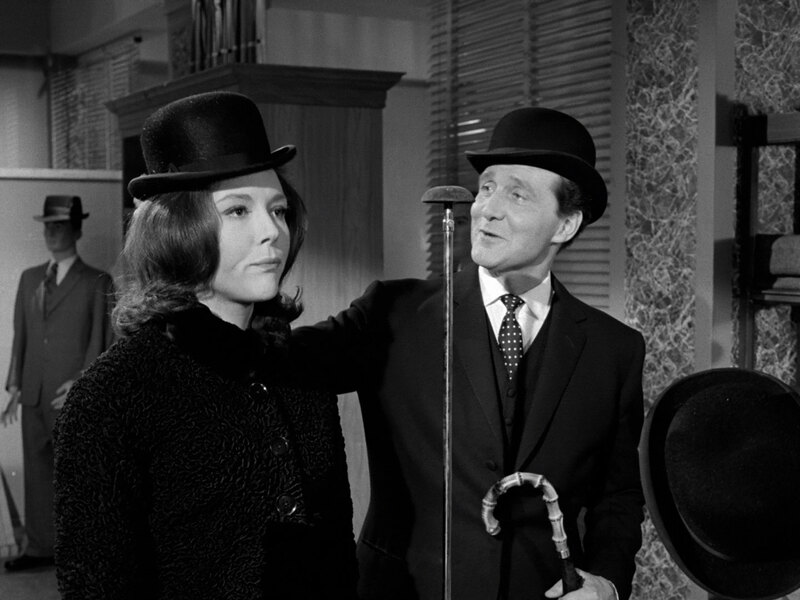 Steed dispatches Farthingale with his steel-lined bowler and Marco with his umbrella while Mrs Peel wrestles with Massey. Marco recovers and catches up to them but is disarmed and beaten with a cricket bat. Mrs Peel retrieves his revolver and wings Wentworth with it when he appears. Wentworth staggers back upstairs and tells Kane they're beaten, it's over. "Over?" barks the old man, "It's not over yet." and he wheels himself towards the lift. Wentworth realises he means to blow them all up and knocks his wheelchair over but not before the button is pressed and the lift starts to descend. The Avengers see an empty chair tumble down the steps and rush to stop the lift, Steed managing to force the doors open to halt it inches from detonation point. Mrs Peel asks Steed if it was really alright for them to take the bicycles they're riding and he replies, "Of course. After all, we did save them from the biggest closing down sale of all time".